From you Online Shop dashboard, click Products to open the Products overview. Here you can sort, add and delete products. 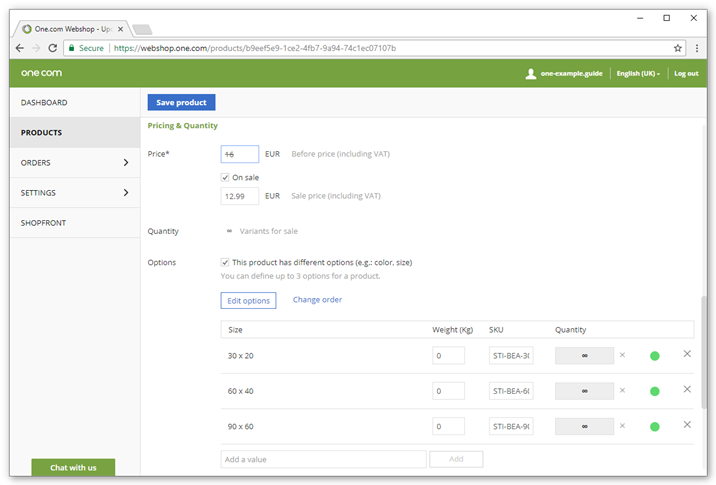 Sort products - Click the menu in the top right corner to sort your products by low stock or categories. Delete products - Select a product by checking the box in front, and click Delete in the top right corner. 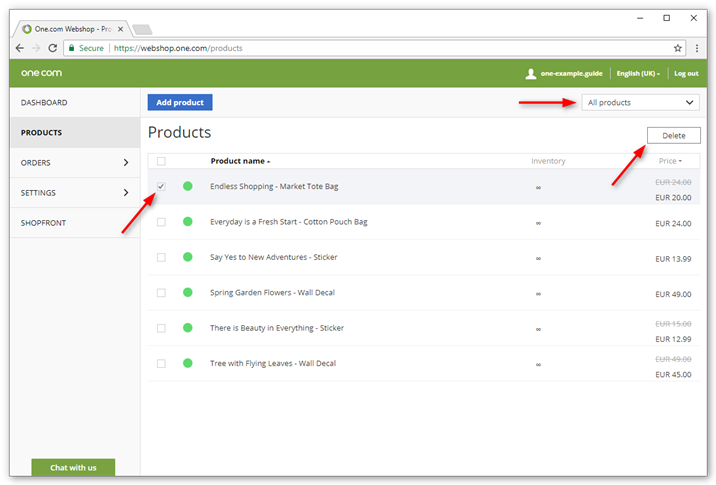 Add products - Click the Add product button to add a new product. To start, you need to enter basic information about your product, so that your customers know what it is you are selling. Title - The name of the product that is visible in your shop. Description - A description of your product. You can use styling to make your description more attractive, or add a link to additional information about your product. 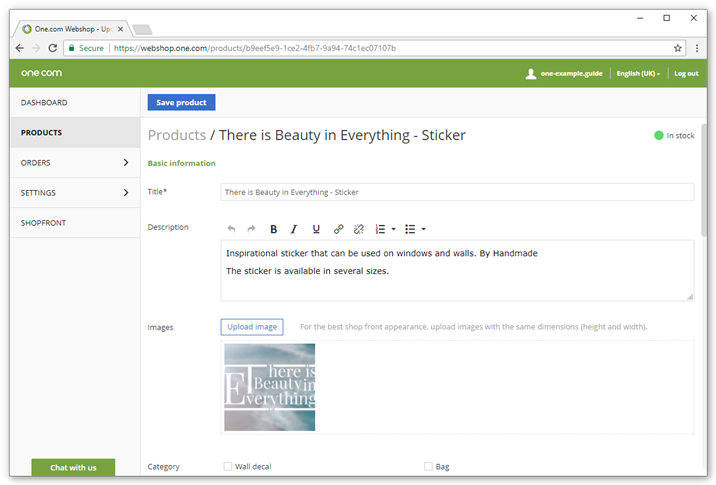 Images - You can upload up to 6 images of your product. The first image from the left, will be the main product image. You can also give each image an ALT text. Category - You can sort your products by category, you can select more than one. To create a new category, click Add/Edit categories. Read more about categories and options. Visibility - Select whether your product should be visible or hidden in your shop. This can be useful, if you want to hide a seasonal product. Promotion label - You can promote your product with a promotion label. For example, "NEW", "50% OFF" or "Popular". The text will be shown on top of your product to make it stand out. Read more about promoting your products. Next you need to set pricing and options for your product. Price - You need to set the price for your product. Select the On sale box, if you want to set a sale price. That way your customers can see they get a discount. Weight - If you want to calculate your shipping costs based on weight, you need to set the weight of your product. Otherwise it's not needed. Read more about shipping options. Quantity - The number of products you have available. If a product is out of stock, this will be visible in your shop. Check the box for Unlimited if you will never run out. SKU - You can enter a SKU code to identify your product in your stock. For example, a combination of name, color and size. Read more about Stock Keeping Units (SKU). Options - You can specify different options for your product, like colors or sizes. Check the box if you want to add an option. Read more about categories and options. Note: When you specify options for a product, you need to set the weight, quantity and SKU for each option separately. To optimize your shop for search engines it's important that each product page has a unique descriptive URL and meta description. URL - Each product has a URL, so you can link to it directly from other pages. By default, the URL is based on the title of your product, but you can edit it here. 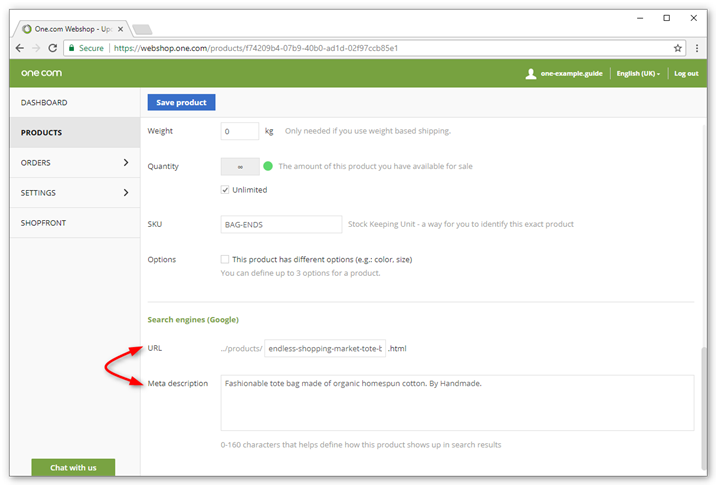 Meta description - You can specify a meta description for each product, to optimize SEO. Read more about meta descriptions. How do I create a coupon for my Online Shop? How can I add a digital product to my Online Shop? How do I manually capture a credit card payment?